Richard Morton Sherman (born June 12, 1928) is an American songwriter who specialized in musical film with his brother Robert Bernard Sherman. Some of the Sherman Brothers' best-known writing includes the songs from Mary Poppins, The Jungle Book, Winnie the Pooh, Chitty Chitty Bang Bang, The Slipper and the Rose, and the Disney theme park song It's a Small World (After All). Richard Morton Sherman was born in New York City to Russian-Jewish immigrants, Rosa & Al Sherman. Together with his older brother Robert, "The Sherman Brothers" eventually followed in their songwriting father's footsteps to form a long-lasting songwriting partnership. Following seven years of frequent cross-country moves, the Sherman family finally settled down in Beverly Hills, California in 1937. Throughout Richard's years at Beverly Hills High School he became fascinated with music and studied several instruments including the flute, clarinet, piccolo and piano. At his 1946 graduation from Beverly Hills High School, Richard Sherman and André Previn played a musical duet. Previn played piano and Sherman played flute. Coincidentally, in 1965 both composers won Oscars in music categories for different films. At Bard College, Sherman majored in Music, writing numerous sonatas and "art songs." His ambition to write the "Great American Symphony" eventually led him to write songs. Within two years of graduating, Richard and Robert Sherman began writing songs together on a challenge from their father, songwriter Al Sherman. In 1953 Sherman was drafted into United States Army joining the band and glee club. He served as a musical conductor for both groups and remained in the U.S. during his time in the service. He was not in combat. During this time, his brother Robert worked with other songwriters. In 1955 Sherman was honorably discharged from the Armed Forces. In 1957 Sherman married Elizabeth Gluck with whom he had two children: Gregory and Victoria. Lynda (Sherman) Rothstein is his daughter from a previous marriage. In 1958 the Sherman Brothers had their first Top Ten hit with "Tall Paul," sung by Mouseketeer Annette Funicello. The success of this song got the attention of Walt Disney, who eventually hired the Sherman brothers as staff songwriters for Walt Disney Studios. While at Disney, the Sherman Brothers wrote what may be their most successful song: "it's a small world (after all)," for the 1964 New York World's Fair. Since then, "it's a small world (after all)" has become the most translated and performed song on Earth. In 1965, the Sherman Brothers won two Academy Awards for the film Mary Poppins (1964), which includes the songs "Feed The Birds," "Supercalifragilisticexpialidocious," and the Oscar winner, "Chim Chim Cher-ee." After Mary Poppins, the Sherman Brothers won nine Academy Award nominations, two Grammy Awards, four Grammy Award nominations and 23 gold and platinum albums. The Shermans worked directly for Walt Disney until Disney's death in 1966. Since leaving the company, the brother songwriting team has worked freelance on scores of motion pictures, television shows, theme park exhibits and stage musicals. Their first non-Disney assignment came with Albert R. Broccoli's motion picture production Chitty Chitty Bang Bang in 1968, which garnered the brothers their third Academy Award Nomination. In 1973, the Sherman Brothers made history by becoming the only Americans ever to win First Prize at the Moscow Film Festival for Tom Sawyer, for which they also wrote the screenplay. The Slipper and the Rose was chosen as the Royal Command Performance of 1976 and was attended by Her Royal Highness, Queen Elizabeth, the Queen Mother. A modern musical adaptation of the classic Cinderella story, "Slipper" also features both song-score and screenplay by the Sherman Brothers. That same year the Sherman Brothers received their star on the Hollywood "Walk of Fame" directly across from Grauman's Chinese Theater. Their numerous other Disney and non-Disney top box office film credits include The Jungle Book (1967), The Aristocats (1970), The Parent Trap (1961), The Parent Trap (1998), Charlotte's Web (1973), The Many Adventures of Winnie the Pooh (1977), Snoopy, Come Home (1972), Bedknobs And Broomsticks (1971), and Little Nemo: Adventures In Slumberland (1992). Outside the motion picture realm, their Tony-nominated play, Over Here! (1974) was the biggest grossing original Broadway Musical of that year. The Sherman Brothers have also written numerous top selling songs including "You're Sixteen," which holds the distinction of reaching Billboard's Top Ten twice; first with Johnny Burnette in 1960 and then with Ringo Starr fourteen years later. Other top-ten hits include, "Pineapple Princess" and "Let's Get Together." In 2000, the Sherman Brothers wrote the song score for Disney's film: The Tigger Movie (2000). This film marked the brothers' first major motion picture for the Disney company in over twenty eight years. In 2002, Chitty Chitty Bang Bang hit the London stage as a musical and received rave revues. Chitty Chitty Bang Bang is currently the most successful stage show ever produced at the London Palladium, boasting the longest run in that century-old theatre's history. In 2005 the musical premiered on Broadway (New York City) at the Hilton Theatre. 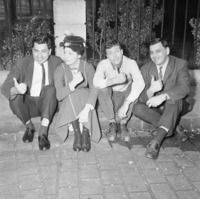 The Sherman Brothers wrote an additional six songs specifically for the new stage productions. In 2003, four Sherman Brothers' musicals ranked in the "Top 10 Favorite Children's Films of All Time" in a (British) nationwide poll reported by the BBC. The Jungle Book (1967)_ranked at #7, Mary Poppins (1964) ranked at #8, The Aristocats (1970) ranked at #9 and Chitty Chitty Bang Bang (1968) topped the list at #1. A new Disney and Cameron Mackintosh production of Mary Poppins: The Stage Musical made its world premiere at the Prince Edward Theatre in December 2004, featuring the Sherman Brothers' classic songs. The show went on to successful runs in New York and Los Angeles. From 2002 onwards, Robert Sherman lived in London, England. He moved from Beverly Hills, while Richard Sherman remained in California. The geographical separation did not impede the brothers' collaborative process. The brothers credited this to fax, e-mail, and the low cost international telephone service. Both brothers frequently traveled between Los Angeles, New York, and London for their work. After Robert's move, the brothers continued to collaborate on various musical plays until Robert's death in 2012. 1976 A Star on the Hollywood Walk of Fame awarded to "Richard & Robert Sherman" on November 17, 1976, located at 6914 Hollywood Blvd.